One of the most important things to remember is to pull the car to the side of the road, turn it off and turn on the emergency brake to avoid an accident. Once you get the supplies from the back (spare tire, jack and tools), you’re ready to go. 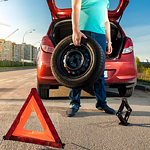 Loosen the lug nuts, jack the car up, remove lug nuts and replace the tire. Tighten lug nuts and let down car. Stay safe when you’re out on the road and make sure your car is in as good of condition as possible. Bring it to our shop for a follow-up service check.